Online portfolio platform introduces new customisable profile and project pages. Behance has long been known as a go-to place to find the best creative work from around the world. Since its inception, the online portfolio platform has become an inspirational resource for everyone in the creative community, whether that be as an artist wanting to get their work out to the masses or an employer searching for new talent. However, with the arrival of multiple no-coding-required, easy-to-use website builders in recent years, its fair to say Behance started to lose a bit of its lustre. But that all looks set to change, with the company yesterday revealing brand new Behance profile (see above) and project pages to better showcase creatives' work. And we think it has certainly fulfilled that brief, especially when you compare the new profile page (above) to the previous version (see below). The all-new Behance profile page has been updated to feature larger, single project images to really let the work do all the talking. And the text that was once displayed below the images – name of the project, likes and views – can now be seen by simply hovering over each project. There's also now the option for creatives to upload a custom banner image to their Behance design portfolio – a subtle but hugely beneficial feature to add personality and keep a profile on brand. And it's ridiculously easy to set up, using a simple drag and drop/reposition system with a image of your choice. More information on adding Behance profile banners can be found here. The updates don't stop there. The Behance team has updated the layout of individual project pages to help creatives present their work in the best possible way, and at the same time make it easier for viewers to appreciate it. Large hero images fill the screen, with project and creator information at both the top and bottom and actions including share, save, follow and appreciate present the entire time. 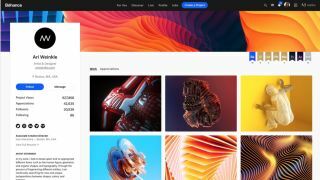 It's clear Behance and Adobe have pulled out all the stops for this update, bringing the site up-to-date and in line with other highly visual platforms like Pinterest. The new look has been rolled out already, and users don't need to do anything to activate the new look. Question is, will this be enough to fully put Behance back on the map? Watch this space.